one − = zero Required Please enter the correct value. The consumer price index (CPI), a measure of inflation, came in hotter than expected last Friday, registering 2.3% year over year in August on expectations of 2.0%. With the five-year Treasury yielding 1.19%, government bond investors are now receiving a negative real rate of return (because 2.3 minus 1.19 comes out to negative 1.11%). This is highly constructive for the price of gold. 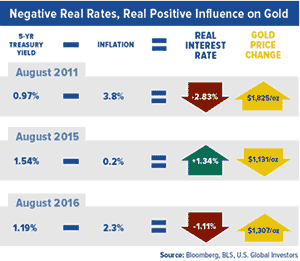 As I've discussed many times before, the yellow metal has benefited when real rates have fallen below zero. This was the case in September 2011 when gold hit its all-time high of $1,900 per ounce. 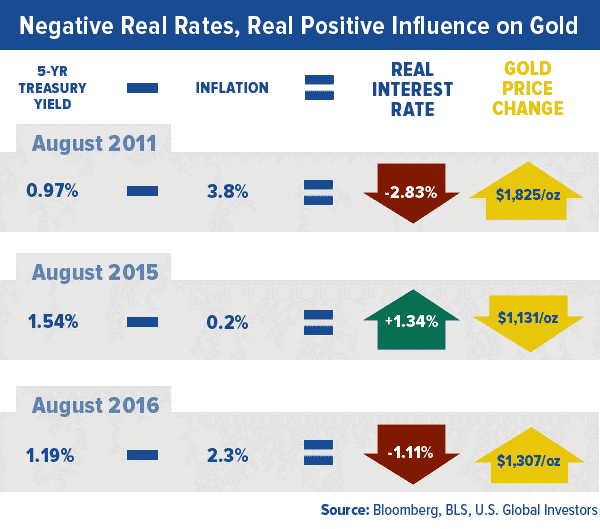 And last year around this time, the opposite was true – positive real rates were a drag on gold. Although gold sunk to a two-week low on a strong U.S. dollar and fears over this week's U.S. Federal Reserve meeting, the drivers are firmly in place to push prices higher. 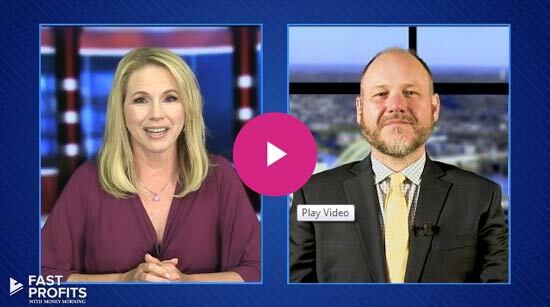 Maybe you've heard that a new book out right now is planting propaganda in the war on cash. In "The Curse of Cash," Harvard economics professor Kenneth Rogoff makes the case that nixing paper money – at the very least, larger-denominated bills – "could help more than you might think" in combating criminal activities such as drug trafficking, corruption, extortion and money laundering. It could even prevent the spread of terrorism and discourage illegal immigration, Rogoff argues. It gets even worse. Central banks, he adds, should have the latitude to drop interest rates below zero during recessions to spur spending. If the Federal Reserve tried this now, of course, many people would likely convert their savings into paper – which at least yields 0% – and hoard it in bedroom safes. This is precisely what many Germans have reportedly done, prompting safe manufacturers to scramble to meet demand. But in a world where nothing larger than a $10 bill exists, hoarding cash would be highly impractical. Better to buy that new boat you don't need! While we all agree that corruption and terrorism are things that should be stopped, killing cash is the absolute wrong way to go about it. Instead, perhaps Rogoff should consider "The Curse of No Cash." Does he not recall what happened in Cyprus just three years ago? The government ransacked citizens' bank accounts to "fix" its own mistakes and mismanagement. In example after example, people's rights to save and freely hold cash have been disrupted, with tragic results. Rogoff is either an idiot, or believes he is part of the elite that won't be impacted by the left's agenda of increasing government control. Its just like the people advocating for increased immigration of a population that has demonstrated that they will not integrate or subscribe to our values – they live in their walled-offed compounds and fly on private jets so they won't feel the consequences.